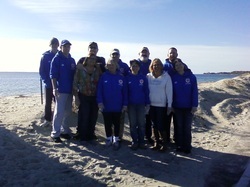 The Falmouth DPW Engineering Division has an AmeriCorps Cape Cod member volunteering in their office two days each week, assisting them the Federal National Pollutant Discharge Elimination System (NPDES) program at no cost to the Town. The AmeriCorps member's job is to assist the Town in developing public education and outreach programs about stormwater pollution; which is required under the NPDES permitting process. Special thanks to the FCTV staff, The Falmouth Dog Parks, Inc., AmeriCorps Cape Cod, Keith Hopkins, Jerry Potamis, and especially to Mike Carroll and our star, Henry: P.I. Falmouth named one of the Top 10 Dogtown USA towns! 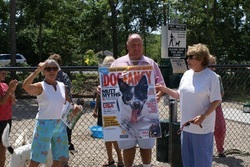 Falmouth Dog Park President Barb Schneider presented Selectmen Murphy and Flynn with a HUGE replica of the September edition of Dog Fancy Magazine at Sunday's pool party, and announced that the issue announced that Falmouth was the only city or town in Massachusetts to be selected as one of the top 10 DogTown U.S.A. towns. Selection is based on how dog-friendly the community is, the opportunities for dogs to enjoy recreation, hotels, restaurants, etc. with their owners, the programs in place to help care for the community's dogs, and, of course, the parks that welcome dogs! We are pleased to report that our first annual appeal, which we conducted town-wide in the 4th quarter of 2012, netted the Falmouth Dog Park over $3000 in funds! These funds will be used to help offset our annual expenses, which exceed $5,000. We would like to say THANK YOU! 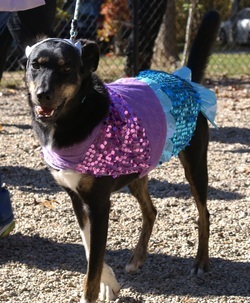 to over 70 donors who were kind enough to include the Falmouth Dog Park in their holiday giving. And we would especially like to welcome the 29 new donors who joined with us this year to help sustain our great dog park. How many ways can you say "Thanks"? Many of you recently received our first annual appeal letter in the mail. We hope you will make any size donation. Remember you can give a donation in honor of someone, and have us send you a card that you can give as a gift to someone who loves the park - how about a stocking stuffer for your pup?! We also hope you will consider giving one of our t-shirts, hats or magnets during the holiday season. 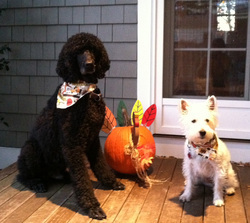 They are available at a number of places around town, including Uptown Dog Cape Cod and at Falmouth Pet Store. But there are other ways you can give thanks for all that the park provides. This past month’s weather has made it tough to keep the park pristine. We need branches picked up, leaves raked and removed from the fenced area, and the sand and gravel spread out more evenly. We try to keep a rake and broom in the entry area, so feel free to donate some time if you can spare any to help us. We also are looking for a few more people to serve as stewards. This is a simple way to help out, it takes only 15 minutes and you select the time of day, and what day you wish to serve as steward each month. Once you are trained, you will receive an email toward the end of the month asking for the day or days you can be steward the following month. Once your day is confirmed, you pick the time to check and possibly change the waste station bags, and deliver them to the dumpster, sweep the concrete pads, and check the park for any loose trash or forgotten poop piles. We hope a few of you will call and offer to help. When enough volunteer each month, each person only takes one or two times monthly. Finally, please consider joining the Board. We meet once every few months in the late afternoon on a Wednesday, and we need people with almost every type of talent or interest. Call the number in the green box if you would consider serving. We can guarantee you will enjoy the other members because they love dogs, just like you!. ❑ We need people to bring rakes, and rake up leaves and remove them from the fenced-in area. ❑ Get involved or donate; call to volunteer as a steward; take a minute to pick up trash; respond to the annual appeal - send a donation, no matter how much it is; give a t-shirt, a magnet or hat as a holiday gift . ❑ Please read the rules and abide by them; they are designed to keep canines and humans safe. 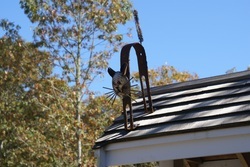 ❑ Our mailing address is PO Box 93, in East Falmouth, MA 02536. The Board is grateful for all of you who: follow the rules, help with upkeep, donate, participate in our activities, save money in your “Doggie Piggy Bank,” build fabulous pieces of art for the park, sponsor our waste stations, serve as a steward (please thank them when you see them at the park!) or as a Board member, buy our magnets or hats or t-shirts, take the time to call and report some unsafe behavior or situation, AND for all those canines who come to the park with a great big smile ready to play!! And we want to especially thank the Falmouth Police. The Falmouth Police have checked the park 85 times in 2012 to make sure everything is safe at the park. We are so grateful for that and want to thank Detective Mike Simoneau for serving on the Dog Park Board as well as all those on the force who have helped make the park feel much safer because of their attention and frequent visits. Please remember to say thank you if you see one of them stop by ! Our annual request for donations has begun. Maintaining the dog park costs roughly $5,000 annually (i.e. insurance, pea stone replenishment, refuse bags, website hosting, supplies). Fundraising is critical to keeping this park open, safe, and in good condition. Won’t you consider supporting the Falmouth Dog Park? We appreciate all levels of support and encourage you to consider a gift in honor or memory of a special person or dog. Your gift in any amount will help us maintain this valuable town resource. If you are a regular user of the park, consider a gift of $180, the equivalent of just 50 cents a day, or $90, a mere 25 cents a day. Please visit the Donate page to see our Appeal letter and to download a donor form. During this holiday season, how about a great Falmouth Dog Park T-Shirt or hat for your favorite human? Take at look at the great products you can purchase from us. And finally, we are always looking for stewards to help us keep the park clean and safe for dogs and humans alike. Consider helping out by volunteering to be a Steward. 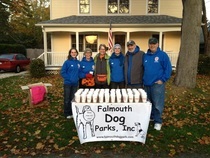 The Falmouth Dog Park volunteers were up at the crack of dawn on Saturday, Oct. 27 to help out at the Cape Cod Marathon. We staffed two water stations to help keep the runners hydrated during their run to the finish line. The King Street station was staffed by Dog Park Board Members and Stewards Heather Russo, Barb Schneider, Vera Pavel, Mort Cohen, and Frank Fernino, shown here. The second station at Surf Drive was staffed by Pamela Rothstein, Ellen Sullivan, Carole Dembkowski, and Theresa Martens. Congratulations to all the runners and volunteers who help to make this a great marathon weekend. The Second Annual Howlin' Good Time got off to a great start thanks to the Falmouth Fiddlers' music and the incredible weather. Again the event drew a crowd of canines and humans all there to have lots of fun. Snip 'N Clip offered nail clipping and many took advantage of that opportunity. Besides introducing Sue Beardsley's Mini-Dog Park Art in the Park, Susan Loucks' cat on the kiosk, and the new bench, thanks to Skippy and Nancy Weinstein, Barb Schneider, president of the Falmouth Dog Park Board announced plans for a walkway inside the park, and hopes for another bench, and a patio and possible memorial area around Cleo's Corner - the mosaic wall and bench outside the park. Winning Best Pair was the beekeeper and his three bees, winning grooming certificates from Snip N Clip; Funniest was the cowboy winning a gift certificate from Stone L'Oven; and Best Character from a Book was the Pirate of the Caribbean, also winning a gift certificate from Stone L'Oven. The weather cooperated and neither dog nor human wanted to leave the party. Falmouth artist Sue Beardsley has created a number of wonderful sculptures for the party. Take a look at our photos, or stop by the park for a better look.